I haven't had a noodle pot for lunch for a while and I've noticed their slow build up on the Foodstufffinds Shelf of Noodle Pots, making it have a noticeable bend through their weight. And so I picked up the one with an egg on the pot simply because I fancied some fried noodles with my traditional three boiled eggs on a Saturday lunchtime. Although the "tradition" has not been about for more than a couple of weeks, but I'm thinking of phasing it in. Mainly because boiled eggs are the only things I can cook properly, and having said that "properly" equates to 70% of the time! 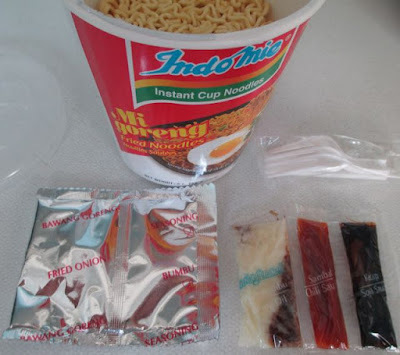 So I unwrapped the plastic wrapping around this pot of Mi Goreng Fried Noodles, produced in Indonesia by Indofood, and I was at first taken aback by how many sachets there were. There was a sachet with Bawang Goreng Seasoning and also a Bumbu Seasoning sachet, as well as a sachet with more separate compartments for Minyak Bumbu Seasoning Oil, Sambal Seasoning Sauce and also Kecap Soya Sauce. My first instinct was that this was going to be complex to prepare. That sinking feeling threatened my resolve as I was hungry after a trip to the gym and just wanted to eat straight away. I shook the feeling off and dropped the plastic fork into the spare cutlery compartment in the drawer, and opted for a more robust metal fork. 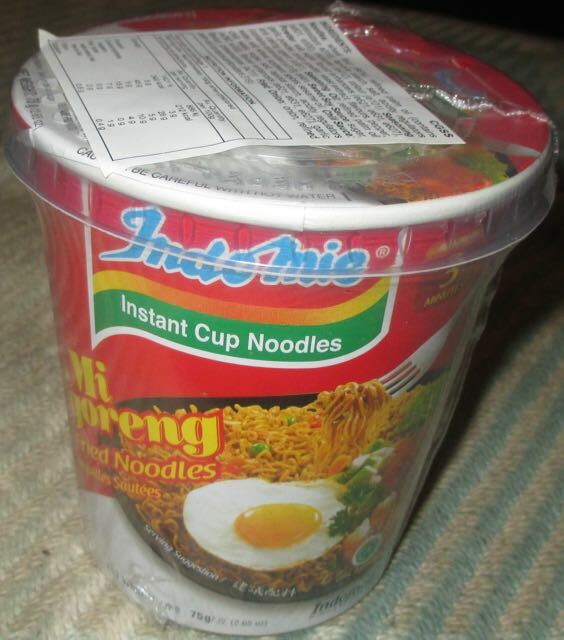 I scanned the instructions as the kettle boiled and was pleased to see that once the clump of fried noodles had been soaked in freshly boiled water with the plastic lid on for three minutes, all you have to do is dump all the sachets on top of the wet hot noodles and stir. I added freshly boiled water and left the pot with the lid on whilst I boiled the eggs. 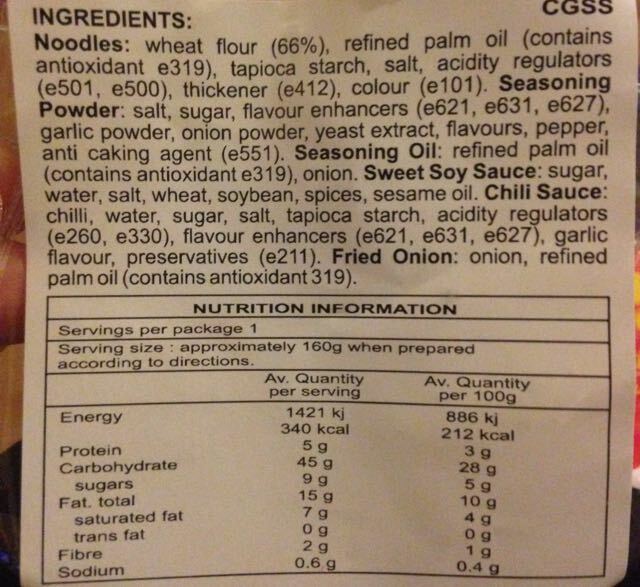 Then I added all the sachets in one big blob and mixed them all well in to the wet hot fried noodles. The concoction smelt just like a traditional Goreng, which I've eaten many times in restaurants. It had a medium warming chilli spice and tasted just as good as it smelt and just as traditional feeling, even in its little cardboard pot. I ate a few noodles and was impressed how my chin weathered the storm, as generally I end up wearing most sauces from noodle pots during the eating process. Having said that this Mi Goreng Fried Noodles was messy and yet fun to prepare in a strange sort of dump everything in and stir way. The blobs from the five sachets were very easy to mix in to the stringy fried noodles and the finished noodle pot meal was very very tasty indeed. Especially whilst enjoying slightly overly boiled eggs!